Permit# 2018-489889VILLA WITH PRIVATE POOL!! !Come visit the Villas of South Padre Island in style while staying at 6408 Fountainway Dr. This 4 bedroom 3 1/2 bath Villa offers a contemporary luxurious feel that you might not expect while visiting the world's longest barrier island. This home entails two bedrooms with queen beds and another two bedrooms with two twin beds. This makes for a comfortable sleeping arrangement for 8 and is ideal for two families of four. The kitchen is stocked full of stainless steel appliances and has plenty of kitchen ware to accommodate all of your culinary needs. The Villas of South Padre offers private beach access, tennis courts, and a community pool area. However, you won't need to visit the community pool since 6408 Fountainway Dr. has it's own private pool.This home is conveniently located within walking distance of the beach, Sea Turtle Rescue, South Padre Island Nature and Birding Center and Texas' biggest beach bar Clayton's. Enjoy Clayton's firework display from the beach every Friday and Saturday from memorial day to labor day. 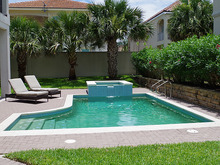 The Villas of South Padre is a gated community with 24 hour security ensuring a safe friendly environment. So do wait too long and book your next island getaway now!